This blog post is long overdue, but I wanted to introduce you all to the One World Futbol Project. It uses a "Give One Get One" model - you purchase a soccer ball, and second ball is donated through a partner organization to an area with children in need, including war zones, refugee camps, and impoverished communities in the US and throughout the world. According to the website (Dec 2010), "One World Futbols have been delivered to 59 countries through nearly 100 organizations." This ball is incredible. It is made from a "unique (proprietary) closed-cell foam," a material similar to the material used in Crocs sandals*. (I am VERY curious as to how it works... but the founder is keeping this quiet for now....) The ball never needs a pump and it never goes flat. This is not an exaggeration. It is so far indestructible. Nothing I have seen or read can deflate this ball, not urban landscapes, barbed wire, lions, pickup trucks, or two enthusiastic German Shepherds. 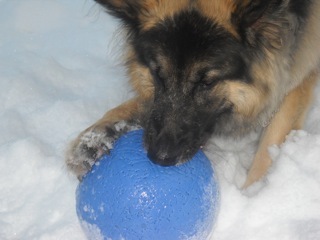 Yes, back in July I bought one of these balls for my parents' dogs - two German Shepherds with a track record of destroying soccer balls. To put it in perspective, here is a picture of the two "current" soccer balls in their yard - a One World Futbol and a traditional soccer ball. Take a closer look at that One World Futbol taken in December, 2010 - that is a LOT of teeth marks! It is amazing to watch this ball, in the mouth of a 120 pound dog, as it alternates between being chomped on and re-inflating in the dog's mouth. OneWorldFutbol by C. Mytko is licensed under a Creative Commons Attribution 3.0 Unported License. Inventor and music producer Tim Jahnigen, from our very own Berkeley, California, provided the initial idea. (You can check out his Huffington Post blog posts.) The musical artist Sting put up the cash for research and development. (The two men know through Jahnigen's work.) The project officially launched just a few months ago on July 8, 2010, timed with World Cup fever. You can read more about this amazing ball on SFGate or One World Futbol's Press Page. Better yet, go to their website and "Give One Get One"! * Crocs are made of some petroleum-based polymer, but even their site will only divulge that the shoes are made of "the company’s proprietary closed-cell resin, Croslite™" which doesn't tell us much. And it certainly does not give any insight as to the composition of a One World Futbol.... Although the ball is manufactured by the Canada-based Foam Creations, whose founders Marie-Claude de Billy and Andrew Reddyhoff originally invented Crocs and manufactured the shoes from 2003 - 2008.